No matter how careful you are, there’s always the possibility of an accident. 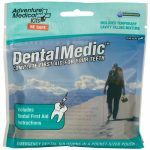 Of course, the adventure seeker in you won’t stop hiking, climbing or hunting just because of a couple cuts and scratches. With that said, when you’re out in a remote area a few hours or even days from medical help, it’s a good idea to come prepared for the worst. 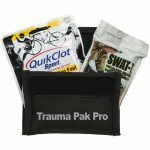 While standard band aids can help with minor scrapes, you’ll want something like a trauma kit for heavy duty injuries. Whether you’ve sliced your hand open on a sharp rock or gotten a cut above your eye while mountain biking, you need to stop it fast. Luckily, the trauma kit offers two solutions. 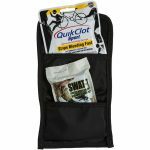 To stop bleed quickly, there’s the QuikClot sport sponge. Thanks to the use of zeolite, it manages to clot blood three times faster than if left untreated. The obvious benefit, of course, is reduced chance of infection. However, by stopping the flow of blood you can also prevent further injuries. Blood can make your hands or feet slippery, making you more prone to fall and hurt yourself especially when rock climbing or hiking steep terrains. Untreated head wounds, especially around the eyes, can impair your vision and cause distraction. Something you don’t need when navigating treacherous trails. But what if you receive a serious wound at your extremities? While QuikClot could help, this trauma kit also comes equipped with the Swat-T tourniquet. It’s easy to apply with zero medical training. All you do is stretch, wrap and tuck. It even comes with instructions printed directly on it so you don’t have to fish around for instructions in the bag. After all, every second counts when treating wounds. 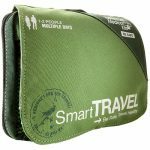 The pack is light and small enough to fit comfortably in your backpack or pocket so you can be prepared every time you go out. Plus it comes with detailed instructions on how to identify and respond to trauma. It’s the perfect kit regardless both at home and on the road.